Women’s History Month – What's Cookin' @ Special Collections?! In the middle of last year, we acquired a book called The Housekeeper’s Book, published in 1837. [Side note: the full title is The Housekeeper’s book : comprising advice on the conduct of household affairs in general ; and particular directions for the preservation of furniture, bedding, etc. ; and for the laying in and preserving of provisions, with a complete collection of receipts for economical domestic cookery, the whole carefully prepared for the use of American housekeepers and the title in our catalog is The Housekeeper’s book:…with a complete collection of receipts for economical domestic cookery, the whole carefully prepared for the use of American housekeepers. So, actually finding this volume and information about it can be a bit tricky, depending on how it’s referenced.] At the time, I sent it on to cataloging, without too much thought. In October of 2016, it popped up on my radar in conjunction with an instruction session I was putting together on antebellum women & cookery. This time, the “By a lady” on the title page caught my attention and, of course, required investigation. When I found out, I wanted to post about it right away, but decided it would be better saved for Women’s History Month, because this was one interesting lady (more on her in a moment–I have to build some suspense)! The plan of the present work is so fully set forth in the title page that little is left to be said by the author in any way of preface. It may, however, be proper to remark, that the work has been founded on the results of actual experience, and is intended for every day use; that the receipts, directions, and general advice have all been prepared with strict view to utility, and true economy; and that nothing has been omitted which the author deemed subservient to the general design–the promotion of domestic happiness by attention to the constantly recurring and inevitable duties of good housekeeping. Intended for middle- and upper-class ladies, and, in some ways, probably for those in their employ, the book has a natural progression: household duties, managing servants, cooking techniques, LOTS of recipes (including homemade cordials and cooking for invalids), flowers, preservation of furnishings, washing, and the ever-common miscellany. A bit out of place, though, it ends with directions for “jointing, trussing, and carving” (with intriguing instructions like “Cod’s Head” and “Half a Calf’s Head.” I guess that gets to the economy aspect of cooking–use everything! So, just who was the lady behind this semi-obscure household guide that didn’t see the success or continued reprinting of some other similar books of the time? Frances Harriet Whipple Green McDougall. With a name that long, I felt there had to be story here and I wasn’t wrong. First off, The Housekeeper’s Book was never published under her actual name and it was her only domestic-related book…sort of. She published her other works as Frances H. Green, since she didn’t marry Wiliam C. McDougall until 1860 and most of her writing was done prior to that. But we’re jumping ahead! Frances Harriet Whipple was born in Rhode Island in 1805. By the time she was in her 20s, she was publishing poetry and began her first brief editorial efforts (the Original), which include her own short writings. By 1830, her writing shifted to reformation efforts, as over her life, McDougall would became an activist for/supporter of temperance, labor, abolition, and spiritualism. Her works would be published in newspapers, serials, books, and other projects edited mostly by others, but also by herself. In 1842, she married her first husband, an artist named Charles Green. After their divorce in 1847, she developed an interest in spiritualism and over the next decade or so, she would write for spiritualism publications and individual tracts. She was also an avid botanist and botany teacher, publishing an illustrated text, The Primary Class-Book of Botany in 1856, which was later expanded and republished with a co-author years later. Around 1860, she moved to California where she met and married William C. McDougall, a California assemblyman-turned-miner and the brother of the state’s second governor, John McDougall. The two remained married until her death in 1878. Her list of individually published poems, articles, tracts, and other pieces is, of course, much longer, as is her list of editorial roles over the years. While she may not have been particularly influential in the culinary world, it’s clear her influence was felt in other places. And her fascinating life story was one I simply had to share! Women’s History Month, Prequel #1: Just What Does Mrs. Fisher Know? It’s hard to believe it, but March is almost here. As a transition post to move us from Black History Month to Women’s History Month, I thought this week, we might talk about Mrs. Fisher. In 1881, the Women’s Co-Operative Printing Office in San Francisco published What Mrs. Fisher Knows about Old Southern Cooking. The publication of a book on my knowledge and experience of Southern Cooking, Pickle and Jelly Making, has been frequently asked of me by my lady friends and patrons in San Francisco and Oakland, and also by ladies of Sacramento during the State Fair in 1879. Not being able to read or write myself, and my husband also having been with the advantages of education–upon whom would devolve the writing of the book at my dictation–caused me to doubt whether I would be able to present a work that would give perfect satisfaction. But, after due consideration, I concluded to bring forward a book of my knowledge–based on an experience of upwards of thirty-five years–in the art of cooking Soups, Gumbos, Terrapin Stews, Meat Stews, Baked and Roast Meats, Pastries, Pies and Biscuits, making Jellies, Pickles, Sauces, Ice-Creams and Jams, preserving Fruits, etc. The book will be found a complete instructor, so that a child can understand it and learn the art of cooking. While the publication location and the introduction itself suggest Mrs. Fisher has, for some time, been located in California, she is careful to continue to align herself with the American South, too, being “Late of Mobile, Ala.” and in which kinds of recipes she extols her expertise, including gumbo, terrapin, and biscuits. If you peruse the table of contents, you’ll see other familiar Southern dishes like fried chicken, Creole soup, corn fritters, and a sea of pickles and relishes. A few of the recipes include commentary (“I have given birth to eleven children and raised them all, and nursed them with this diet” or “This recipe is an old Southern plantation remedy among colored people”) which again remind us of her history and her culinary roots. What Mrs. Fisher Knows about Old Southern Cooking. Table of contents (1 of 4). What Mrs. Fisher Knows about Old Southern Cooking. Table of contents (4 of 4). But, at the same time, she offers us some items and methods you might not expect, given that we’re talking about recipes that date back to the 1840s at least. Home ice cream makers were decades away in 1846 (though they were on the horizon in 1881), but Mrs. Fisher presents us with techniques for ice cream and sherbet. Her “Coccoanut Pie” requires actual coconut, an ingredient available to in the South as an import from the West Indies. While coconut was available in colonial America, it probably didn’t travel well and was likely more common in the South. And her recipes tell us a lot about the mid-19th century food timeline. She incorporates Cox gelatin (Snow Pudding, 110), a commercial product from Scotland that the producers began exporting to America only in 1845. (Commercial, granulated gelatin wouldn’t be mass produced in America until the 1890s.) Nor does she shy away from alcohol, offering variations on brandy peaches and blackberry brandy. Unfortunately for us, we don’t have an 1881 edition of What Mrs. Fisher Knows about Old Southern Cooking (though it IS on our wishlist), but that doesn’t mean you can’t enjoy looking at one! The digital collection at Michigan State University has a copy that includes page images, transcripts, and a PDF. Or, you can visit us and view our 1995 reprint, of course. It may not have that “old book” smell, but it most certainly serves as a reminder of Mrs. Fisher’s legacy. This week, we’re circling back to an influential woman of the 20th century: M. F. K. (that’s Mary Frances Kennedy, all spelled out) Fisher. Fisher was born in Michigan in 1908, but grew up in California. Although she would return there to live several times over the course of her life, it was France that seemed to influence her most. Between 1928 and 1932, she and her first husband lived in Dijon. From 1936 to 1939, she lived in Vevey and Bern, Switzerland. For a short year in 1954-1955, she took her two daughters to live in Aix, France, before returning to California. Her final lengthy time living abroad was between 1959 and 1961, again in Switzerland and France, though she would take additional trips to France in the 1970s. She designed and built a house in Glen Ellen, California, in 1971. She named it “Last House,” and it did become her last permanent resident, until the time of her death in 1992. Fisher had a prolific writing career that included a large number of books, essays, and reviews related to food and food history. During the 1940s alone, she completed six books that blended history, food, and food culture designed for a wide audience. (Her personality and wit jump off of many pages!) However, food wasn’t her only genre. She wrote autobiographical works, novels, and essays, too. Between 1942 and 1944, she was even a writer for Paramount Studios! We are happy to have five of her books among our collection. One of the things I adore are her book covers. They range from simple drawings to collages of image, but they are always something eye-catching and intriguing. The majority of these titles came from a wonderful bibliography of Fisher that is available online. In some cases, it includes brief descriptions of titles. 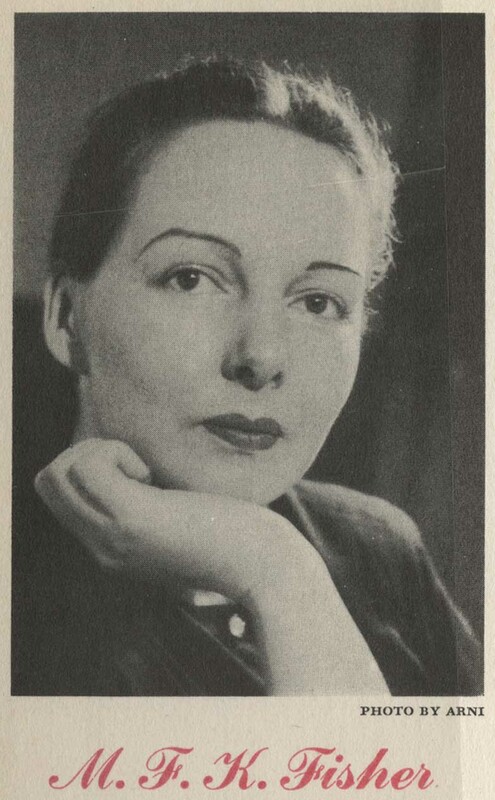 The M. F. K. Fisher Foundation website also include tributes and biographical information–it’s worth a look! I hope you have enjoyed reading our third year of Women’s History Month profiles as much as I have enjoyed writing them. But, of course, every week is an excuse for me to learn new tidbits from culinary history and to share stories with our audience! We’ll be back next week, perhaps with a little less seriousness and a little more frivolity. Until then, eat well!